The moon was painted red by God, 1870. Go look outside tonight, the moon is painted red once again! Pertaining to the lunar eclipse. On the 17th of January, at 2:25 and 35 seconds in the morning, one body affected another body in the heavens, and its color turned strange, and we adults and children here in Lihue witnessed it; and here is my bit of humor, someone said: “The moon has been eaten by God.” And another said, “The moon was painted red with red paint by God.” And there was a lot of new things spoken of on that night, but I cannot carry on about that. 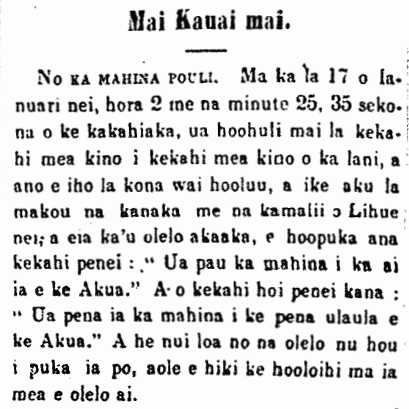 Ka Nupepa Kuokoa, Buke IX, Helu 5, Aoao 4. Ianuari 29, 1870.